Sunny Summer Day on Kilkee Bay in County Clare, Ireland. 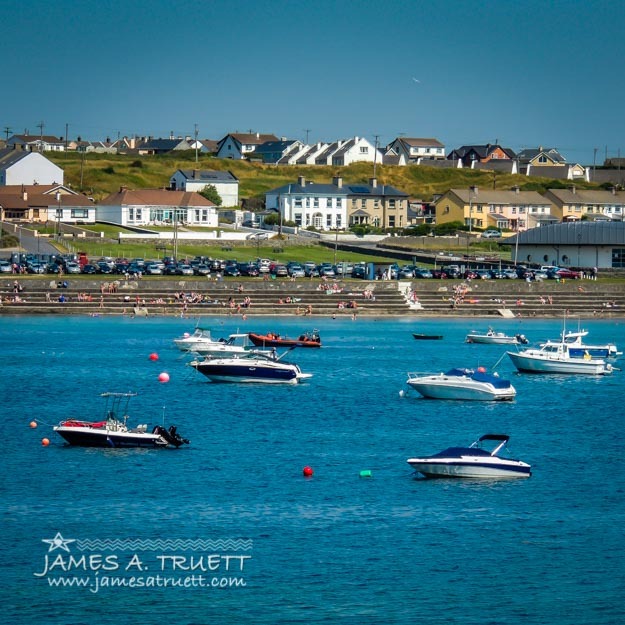 On a sunny summer day, pleasure boats take over the protected horseshoe bay at Kilkee, Ireland, a small seaside resort town with one of the most popular beaches in County Clare. A small fishing village in the early 19th Century, Kilkee blossomed into a trendy holiday destination in the 1830s as transportation to the area improved with steamship service from Limerick via the Shannon Estuary to the nearby town of Kilrush. By the 1890s, the West Clare Railroad was in operation, providing easy access to Kilkee for County Clare residents. With vibrant sea life, Jacques Cousteau once called Kilkee the best dive spot in Europe and one of the top five in the world. Winter population is about 1,000 people. At its peak during the Celtic Tiger years, summer population regularly spiked as high as 25,000! This lovely village has attracted the attention of the rich, famous and royals over the years, and it even was mentioned once in a holodeck program on the scifi TV show, Star Trek Voyager! 2017 Premium Collector's Wall Calendars Now Available!